Let’s be honest - everyone can benefit from another set of eyes when driving in reverse or backing up into a narrow parking spot. Having your passenger jump out of the vehicle to direct you when driving isn’t alway practical, nor do you always drive accompanied. 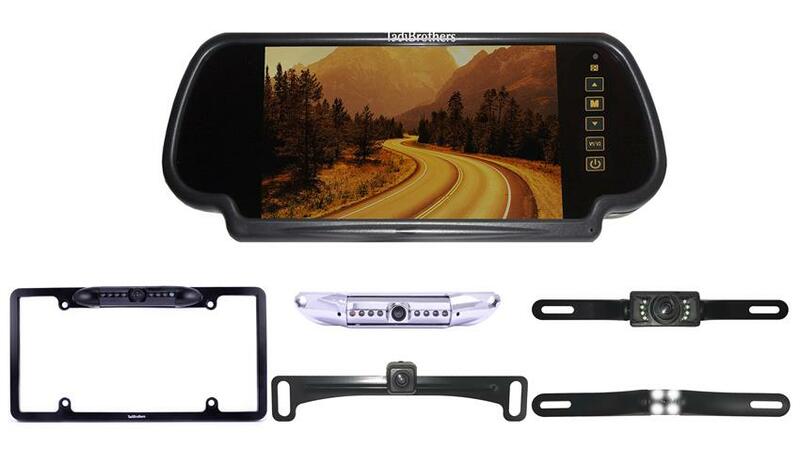 Fortunately, Tadi Brothers has the solution to your driving needs with the 7" Mirror with License Plate Backup Camera. The lightweight mirror monitor clips securely to your existing rearview mirror. This multi-functional piece of equipment can be used as a monitor, regular reflective mirror, and hook up for a DVD player or gaming console making the 7" Mirror with License Plate Backup Camera a supreme buy! This powerful mirror monitor connects to any power source including your cigarette lighter. Everything you need to start seeing the world behind you is included in this package, and you can always add additional equipment to create the perfect all around system. All of our cameras and monitors are compatible with each other. With some cameras, it is very difficult to discern what you are looking at. Instead of the clear, sharp lines that are provided to you with the products from Tadi Brothers, you can be stuck with fuzzy, blurred images. Never worry again about what is behind you with the stunning images from this license plate camera system. On top of capturing remarkable images, this camera is easy to operate and install. Simply screw it onto your existing license plate. Gain awareness today and create a safer ride when you choose a backup camera system from Tadi Brothers. This item includes a 15 Foot cable, if it's going on an RV, BUS or any other vehicle longer than average SUV we recommend upgrading to our premium extension cables located on the top right of the page. is there a camera with a 150 deg. view or will that take 2 cameras. do you have a camery to mount inside by the rear window of a car, i think it will stay cleaner there.